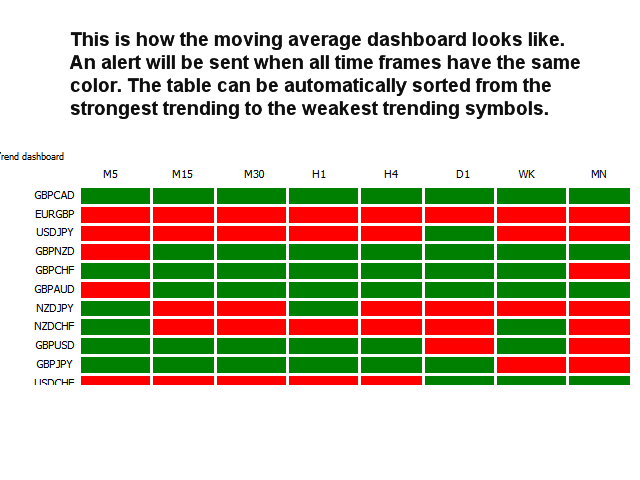 This multi time frame and multi symbol trend indicator sends an alert (paid version only) when a strong trend or trend reversal has been identified. It can do so by selecting to build up the dashboard using Moving average or RSI. It can be used with all time frames from M5 to MN. This free version is limited to EURUSD, GBPUSD and USDJPY and without the option to send alerts. The unlimited paid version can be found here. It is possible to select the time frames to be used. Continuously performs a trend strength rank sorting within the dashboard. It is possible to disable this sorting though to make it easier finding a specific symbol. The symbols will then be visible in the same order as they have been entered in the Symbols parameter. It is enough to place the indicator on one chart and you will receive an alert (paid version only) from any symbol of your choice. Template name: The purpose of this parameter is to make it easier for quick decision if to take the trade or not. Typically you would then use your own custom chart template (.tpl) which for instance could contain a support/resistance indicator. Trend filter to use: List box from where you can select from Moving average or RSI. Enable sorting: Default is true. It will then sort the symbols according to the highest trending at the top of the table. Symbols to scan: Here you will put all symbols you would like to monitor. Every symbol must be entered in the exact way as it is visible in the Market Watch window and separated with a comma, without spaces. Time frames: Set to true for each time frame you would like to monitor. 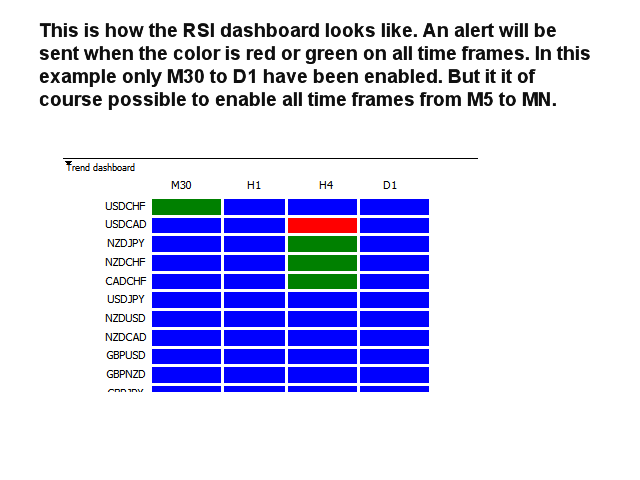 RSI price type: The RSI level is calculated from this setting. Text color: Default is black but can be changed to for instance white in case you have black chart background. Font size: Used for the symbol and time frame texts. Default is 8.